In an economic forum speech, Xi Jinping pledges market openness and takes a veiled swipe at Trump's 'America First' policies. Chinese President Xi Jinping reiterated pledges to open sectors from banking to auto manufacturing in a speech that also warned against returning to a “Cold War mentality” amid trade disputes with U.S. counterpart Donald Trump. 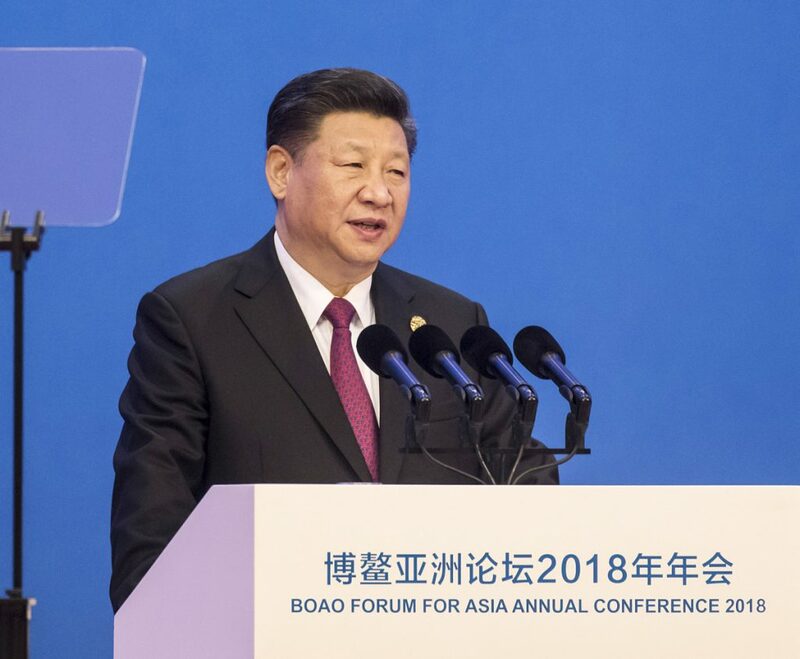 Xi pledged a “new phase of opening up” in his keynote address Tuesday to the Boao Forum for Asia, China’s answer to Davos. While the speech offered little new policy, Xi affirmed or expanded on proposals to increase imports, lower foreign-ownership limits on manufacturing and expand protection to intellectual property – all central issues in Trump’s trade gripes. Trade talks between the world’s biggest economies broke down last week after the Trump administration demanded that China take steps to curtail support for high-technology industries, a person familiar with the situation said. The conciliatory tone of Xi’s speech helped bring risk appetite back to Asian markets, as shares from Sydney to Hong Kong rose alongside oil and metals and Treasuries extended declines with gold and the yen. Xi’s long-planned speech – marking 40 years after the first economic reforms transformed China – was being closely watched after Trump’s plan to hit hundreds of Chinese products with duties. The country faces a credibility gap after years of promises to free up the economy were followed by more centralized control, market-access barriers and state support for local companies. Those practices are at the center of Trump’s threats to levy about $150 billion in tariffs against China. The U.S. has asked the country to reduce its trade surplus by $100 billion, cut tariffs on cars and stop forced technology transfers by foreign corporations, among other things. A White House official who watched a broadcast of Xi’s speech said the Chinese president’s reference to autos after Trump’s Twitter complaints about the issue appeared to be an opportunity to develop trust between the two sides. The official said the U.S. was expecting China to put concrete proposals forward. The speech was attended by leaders such as Philippine President Rodrigo Duterte, Singaporean Prime Minister Lee Hsien Loong, and International Monetary Fund Managing Director Christine Lagarde. Since Trump’s election, Xi has presented himself as a champion of the existing global trading system, comparing protectionism to “locking yourself in a dark room” during a speech last year at the World Economic Forum in Davos, Switzerland. On Tuesday, he took a veiled swipe at Trump’s “America First” policies. Federal Reserve Bank of Dallas President Robert Kaplan said Tuesday that trade issues between the U.S. and China won’t get resolved soon, and he warned of potential damage if the dispute is prolonged.